Our goal is to enhance the lives of animals by providing better animal care and training. We use the science and strategies of behavior change and practical teaching skills with positive reinforcement for animal care and training. We will continue learning about science, strategies, and skill sets we’ll use while teaching and caring for animals. We’ll work to use and maintain high ethical standards which will guide our choices in providing the best animal care possible. We believe that skills and knowledge alone are not enough, but rather we will aim to model and use the training behaviors and strategies we want to see employed in good animal care. Clear and high ethical standards are necessary in trustworthy people to make the most appropriate choices for animals. We manage animals in our care recognizing that we, as a different species, have expectations for animals to be able to live in the society and with interactions which are convenient and comfortable for us. Sometimes what we ask of animals is not natural for the animal and can be uncomfortable or painful for them. As often animals live with us in captivity or as companions by our choice, they deserve to be provided with good animal care and we should help them to live as safely and comfortably as possible. We are caregivers. Our role is to provide good care for animals we are responsible for. This means we want to keep and improve upon their safety, physical, and mental well-being. We support the “Four Cornerstones for the Foundation of Animal Care” which is an ethical guiding principle for providing good animal care advocated by Ken Ramirez. We embrace it as our standard when we consider, evaluate, design, and provide animal care plans. Behavioral management should be provided throughout the animal’s life to include a comprehensive veterinary and nutrition program. Behavioral management means “training and enrichment” (Ken Ramirez). It is an essential aspect of good animal care. Enrichment is defined as changes and improvements to the environment which increase the animal’s behavioral choices and which allow the animal to exercise his abilities and skills. The goal is to enhance animal welfare. "Training is not a luxury, but a key component to good animal care" (Ken Ramirez). "Training is about teaching a dog (or any animal) how to live in our world safely” (Ken Ramirez). “We help animals control their own behaviors well” (Susan Friedman, Ph. D.). Our training purpose is to minimize the animal’s stress and to maximize the animal’s relaxation. We can observe if the animal behaves in a relaxed way. We break training into three components: management, teaching, and maintenance. We design plans for each component and use enrichment in order to make a stimuli and desirable behavior equate to a good thing for the animal. This way we set up the animal for success. “Success” here means that the animal gets good results via their behavior. Management - Designing and providing the environment to make it easier to perform desirable behaviors (target behaviors) and to make it more difficult to perform undesirable behaviors (behaviors other than the target behavior). Teaching - Designing and providing the environment to help to shape behavior and allow the animal to perform desirable behaviors (target behaviors). Maintenance - Designing and providing the environment to maintain desirable behaviors the animal has learned (target behaviors). We support the “Primary Reasons for (Animal) Training and Secondary Reasons for (Animal) Training” which are ethical guiding principles for providing good animal training and advocated by Ken Ramirez. We embrace it as our standard when we consider, evaluate, design, and provide animal training. “If the secondary reasons become primary reasons, animal welfare may be endangered. If the primary reasons are accomplished, animals can be happier, healthier, and more willing to work with their trainers so that training becomes easier and trainers have done their work well” (Ken Ramirez). Cooperative behavior makes it comfortable for animals to work on and participate in management, handling, and care for safety and physical health resulting in safer and more comfortable interactions. We support the “Constructional Approach” to behavioral modification which was first formally recognized by Israel Goldiamond, Ph.D. in 1974. We embrace it as our approach when we design and provide animal training and behavioral intervention plans. The constructional approach is an alternative model to the pathological (eliminative) approach. The pathological (eliminative) approach focuses on eliminating problem behaviors. The constructional approach attempts to solve problems by building behavioral repertoires. The constructional approach consist of four steps. We can customize a training and behavioral intervention plan to an individual learner/animal, the learner’s/animal’s condition and experience, and the situation at the time by using the constructional approach not only when we design training and behavioral plans but also before we start the training session. By basing our plan on the constructional approach, we can reinforce at the beginning of our training because the first criterion is the behavior the learner/animal can perform at the start. We can focus on using positive reinforcement and antecedent arrangement to provide errorless training and shape target behaviors. “Criterion/criteria” here means the behavior we provide positive reinforcer immediately after it is performed. Behavior is a tool for coping with a problem one is facing. Performed behavior is an important asset for surviving and coping with problems. The more tools/repertoire one has, the easier and more comfortable he is to live and survive. We can help to shape and increase the number of tools of the animals in our care with our choices in management, interaction, and training. Our purpose is to provide care and training which enhance the lives of animals in our care by increasing the learner’s/animal’s repertoire. By teaching animals alternative behaviors for problem solving we help them live more comfortably and confidently. We don’t label animals and behaviors. We don’t judge the cause of behavior via personal feelings and impressions without research and evidence. We understand behavior based on behavior analysis. When we work on behavior modification, we collect data and evidence, analyze the relationships between behavior and environments and assess the function of the problem behavior. This procedure is necessary in order to understand the animal’s experience without bias. Also we rule out potential physical health and nutritional problems with a veterinarian and research the animal’s environment, daily schedule of activity and rest, relationships and interactions with people and animals. In this way we work to understand the animal's needs and the problem which the animal is facing. We attempt to remove the problem the animal is facing by improving behavioral management. We change behavior by changing the environment. We support the “Hierarchy of Behavior-change Procedure - Most Positive, Least Intrusive Effective Intervention” which is an ethical guiding principle for providing good animal training and advocated by Susan Friedman, Ph.D.. We embrace it as our standard when we consider, evaluate, and implement the strategy of behavior change. Behavior is response to environment. We can’t control behavior directly but we can change behavior by controlling environment which can affect the behavior. 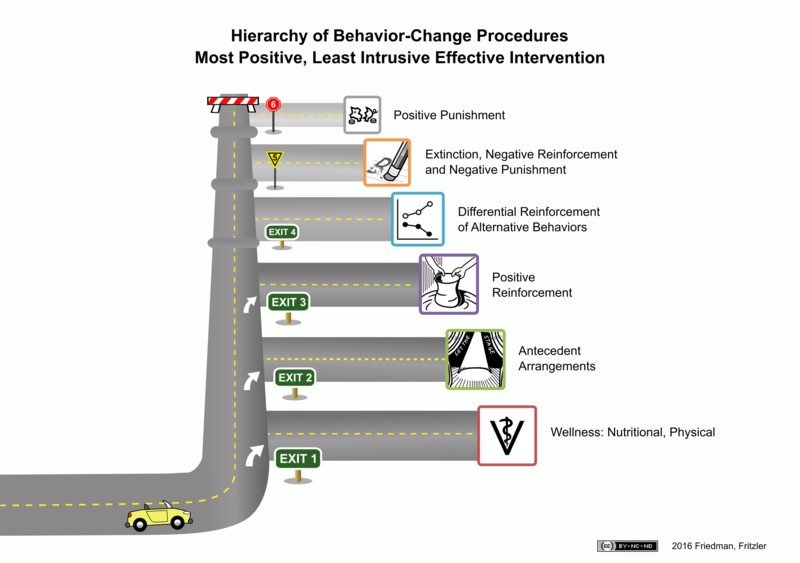 Behavior intervention refers to changing the environment in order to change behavior. Using the least intrusive method means we use the least forceful tools and provide the learner with the power to control their environment/choices. This hierarchy can help you to use the most positive and least intrusive strategies for interactions. We understand the danger in overestimating one’s skills, confidence, and knowledge and recognize the need to continue to learn and grow and choose the least intrusive, most positive approaches to ensure the safety and welfare of animals in our care. If the plan we design using antecedent arrangement and positive reinforcement struggles to help shape the target behavior, we revise our plan and do following things prior to using the strategy of differential reinforcement of alternative behavior or extinction. If the case is beyond the scope of our own knowledge and skills we will consult with other professionals with the same skills and ethics. Everyone has room for improvement. We can only find better alternatives when we look for them. We will continue learning and looking for better alternatives. If the approaches, ways, strategies, tools and skills we have found are scientifically, practically, and ethically intelligent, kinder to the animals, and easily comprehensive for the animal, we incorporate them into our skill set. We will keep providing better animal care and training by endeavoring to continue our own professional learning and improvement.